There’s no getting away from it, Auto Enrolment (also known as Workplace Pensions) is going to be a hassle for your business. Our Workplace Pensions Service takes away the pain. 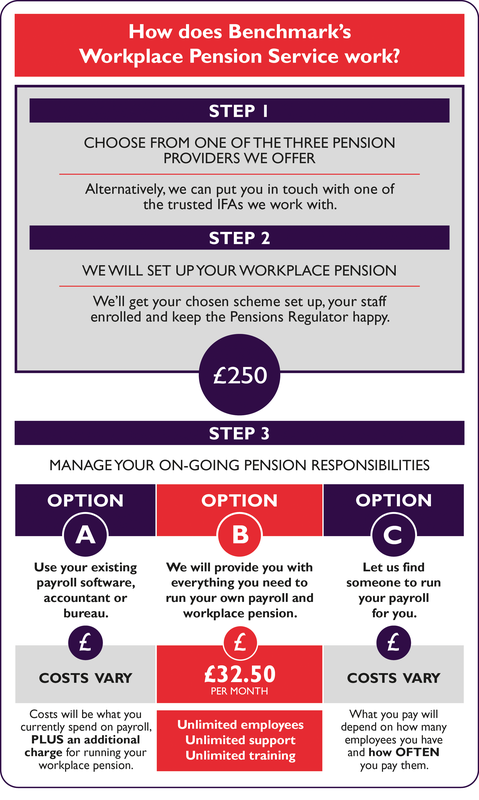 What if you could get Auto Enrolment done for just £250.00? With Benchmark’s Workplace Pension Service, we will manage the entire process for you. From assessing your workforce and setting up your pension scheme to doing your Declaration of Compliance. Wouldn’t it be nice to just get on with running your business? Benchmark Software has been providing accounting and business software for nearly 40 years. Our payroll package has been modified to manage all your workplace pension responsibilities. During this process we accumulated AE expertise that we felt could really benefit small and medium sized businesses. However, you don’t have to use our payroll software for us to sort out your workplace pension. We have three simple options available. So whether you already run your own payroll, use an accountant or payroll bureau, or need a combined payroll and workplace pension solution, we can help you. With the full support of everyone at Benchmark we have managed to build a great CRM and they continue to listen to us therefore year on year CREAM can develop with us as our company grows. Brilliant! It just makes so much difference to how we work and is so easy. I've used another system and Benchmark are more aware, more helpful – they speak my language. © 1978 – 2019 Benchmark Software Limited. Website by Benchmark Web Design.